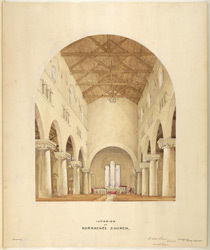 Trinity churches were built by the Trinity Board along the coast of England from the mouth of the Thames to Portsmouth as well as in British India. The churches were provided with funds in return for having beacons installed on their towers in order to serve as lighthouses. Trinity Church, constructed between 1852 and 1855, was the first major church in Karachi. It was designed by Captain John Hill of the Bombay Engineers. The distinctive tall, square tower was 150 feet tall and so made a suitable lighthouse and landmark for vessels approaching the coast.